Last year a group of influential bloggers got together and re-created iconic images for Black History Month using images of black heroines from the past and re-creating them with activists, artists and other influential black women from the present. Known as the Style Influencers Group, Jessica Andrews, Christina Brown and Lexi Felder, along with African Pride, this year celebrated Black History Month by creating similar images, but this time by celebrating the accomplishments of historical black men. Figures like Jackie Robinson, W.E.B. Du Bois, Martin Luther King Jr. and others were portrayed by influential black men in the digital media space, as well as writers and activists. The men were styled by fashion stylist Kristina Taylor and perfectly embodied those who came before them in clothing from Nick Graham and Samuelsohn. In an interview with The Root, Andrews explained exactly what the inspiration was behind picking DeRay Mckesson and others, as well as the historical figures they represented. "We chose influencers who are making strides in their respective fields and shaping the future as we know it. We were honored to work with pioneers like Reggie Ossé, who founded the Loud Speakers Network, and visionaries like DeRay Mckesson, who is currently running for mayor of Baltimore," Andrews said. Although some people may think the newbies are trying to replace the icons, the campaign says it is also trying to represent those who are making black history. "The campaign is not just about honoring black history icons, but also celebrating the young men who represent black history in the making," Andrews continued. "Our influencers have a strong, personal connection to their icons that developed organically. Writer Jared Michael Lowe, who portrayed Langston Hughes, wrote a screenplay based on Hughes' life when he was just 10 years old. It jump-started his love for writing. Those are the kinds of bridges we're hoping to highlight and celebrate with this campaign." 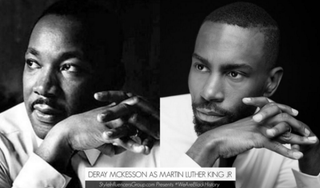 Since the men are influential in the digital space, the conversation about the photos and Black History Month can be followed on social media by using the hashtag #WeAreBlackHistory.